It's a good start for the free fiction on this fabulous Friday morning. There's a fantasy short by best-selling author Kevin J. Anderson, and audio story by Kristine Katherine Rusch, the conclusion of The Classic Tales Podcast's reading of The Call of the Wild, Tales of Terror and more! More to come! • At Daily Science Fiction: "Dark Angel, Archangel" by Kevin J. Anderson. Fantasy. "The train thundered toward him, its sharp light pinning him like a spear. He stood in the center of the tracks facing it, not moving. Defiant. Impotent. The night seemed to laugh around him." • At HiLobrow: "The Man with Six Senses - Part 10" by Muriel Jaeger. Science Fiction. 1927. "I went away and began to write an article setting out a philosophical view of Michael Bristowe’s peculiarity, so far as I had been able to form one." • At Mad Scientist Journal: "Dr. Derosa’s Resurrection: Part II" by R.G. Summers. Science Fiction. "Tt was almost as if my mother was still alive, but not quite. It was a soap opera twist gone horribly wrong. I had spent my whole life without a mother. It was only when Dad was apprehended by the Trongodian government police that I realized how much was missing from my life. By the time I turned thirteen, I was acutely aware of how badly my life sucked." • Flash Fiction at 365 Tomorrows: "Birds of a Feather" by Desmond Hussey. Science Fiction. • At Tale to Terrify: "www.sellyersoul2satin.hel" by William Markley O’Neal, narrated by James Phillips and Veronica Giguere. Horror. 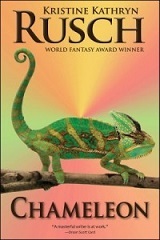 • At WMG Publishing: "Chameleon" by Kristine Katherine Rusch. YA Fantasy. "The other kids call Wilhelmina “Cry-Baby Witch.” They’re right about one thing even if they don’t know it: she’s a witch, but she doesn’t have control of her magic yet. If she did, she’d protect all the animals in Mrs. Anderson’s room, but Willi can’t even protect herself"
Audio The Classic Tales Podcast: "The Call of the Wild, part 5 of 5" by Jack London, narrated by B.J. Harrison. Parts One, Two, Three, and Four. Fiction at HiLobrow: "The Zayat Kiss - Part 1" by Sax Rohmer. Pulp. Noir. Flash Fiction at Every Day Fiction: "Moving Up" by L.A. Fields.